Dwarf morning-glory (Convolvulus tricolor): growing, planting, caring. Convolvulus tricolor - the dwarf morning-glory or tricolour convolvulus - is a short to medium annual plant with solitary long-stalked flowers. The flower is a tri-coloured funnel-shaped bloom about three centimeters wide, blue with white and a yellow centre. Outside: It can be sown directly in open soil from mid-May but the flowering will take place much later. Wait in any case for the earth to warm up sufficiently - if the nights are still cool (less than 10 ° C) it's still too early! Sow in pits: dig each hole a hole 15 cm deep, fill with potting soil, seize three seeds by pressing 3 cm and water. Inside: To obtain vigorous plants, which will climb quickly and will be covered with flowers, sow under shelter from March. Soak the seeds in lukewarm water for 1 hour before sowing to accelerate emergence. The sowing is done in pits, by depositing 2 or 3 seeds in a small hole of 3 cm/1 inch deep, practiced in earth with the help of a pencil or a small stick. Once the seedlings have emerged, you should thin out. Keep one plant per spot. After the frosts, you can plant the morning glories in open soil or in a deep tray. In open soil it will enjoy full sun and a rich and well-drained soil Prepare the soil by breaking it down with a fork, weeding, and then plant with the help of a transplanter. Mulch copiously around your plantations to slow down the emergence of plants that could become competitors. In pots, plant in an enriched soil, possibly with decomposed manure. If you want to harvest beautiful tubers, choose a deep container of at least 30 cm. Plant your morning glory after the last frosts! In the ground it will enjoy the full sun and a rich and well drained earth, in pot, plant in a soil enriched possibly decomposed manure. Water seedlings in fine mist, maintaining the soil always moist - if in a pot make sure you use drainage pots. After a few weeks, watering once a week should be fine. 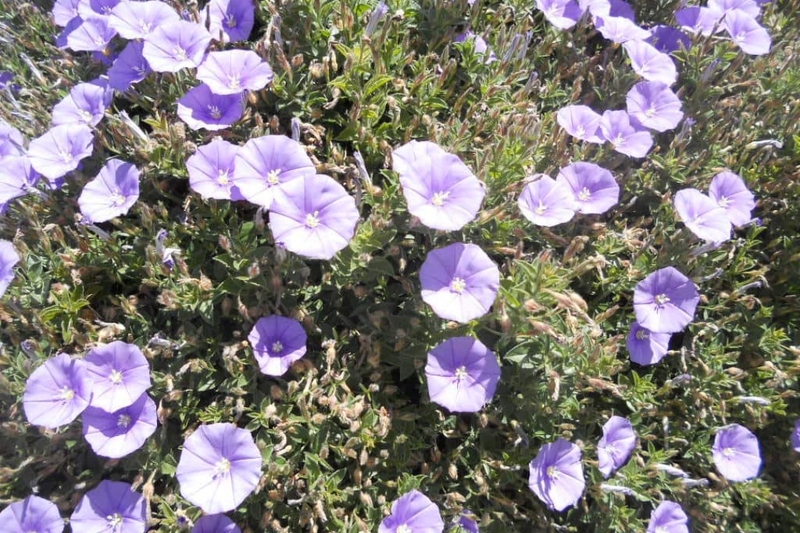 Convolvulus tricolor will multiply mainly by sowing, and will even tend to do it by itself without restraint! Remember to harvest the seeds in late summer. You can sow them in March. The morning glory tends to produce seeds easily. In the fall, it will spread around its many seeds which can be a little invasive! To avoid it, you can pull it out before the seeds dry, taking care not to drop pods.